The popular Tofino Cat boot by Sorel is a uniquely stylish winter boot in an increasingly crowded winter footwear market. Yet, like all Sorels, the Tofino Cate is nearly as functional as the popular and rugged Caribou Boot. The rubber bottom provides solid traction and waterproofing, while the excellent insulation gives the boot a temperature rating of -25 degrees. Another less noticed benefit of the unique upper on the Tofino Cate is the canvas/leather upper makes the boot significantly lighter and less bulky. The Tofino Cate tops the scales at 1 pound, 8 ounces. By comparison, the one-inch shorter Caribou boot weighs nearly a pound more. One thing to keep in mind, however, is that the Tofino Cate isn’t a great mud boot. The attractive furry faux sherling cuff at the top of the boot, which effectively prevents snow from slipping inside as well as providing a nice flair, isn’t an especially easy fabric to clean if it gets muddy. Thus, if your plans take you into lower-leg grabbing deep mud frequently, get another style of boot that is easier to clean. Overall, the Tofino Cate is an ideal winter boot for women who don’t plan on spending much time playing in the mud. While not quite as warm as some other Sorel’s, with a temperature rating of -25 degrees the boot is plenty warm enough for most climates during the winter. The lightweight of the boot also makes it much more pleasant for daily wear, particularly in town and city environments. The Tofino Cate is widely available online. Amazon generally has all colors and sizes in stock, as well as the best prices. The Tarafino Cate is generally priced around $170, although Amazon usually sells them for less. If Amazon doesn't have a particular size or color you want in stock, the next best place to try is Sorel's own website. 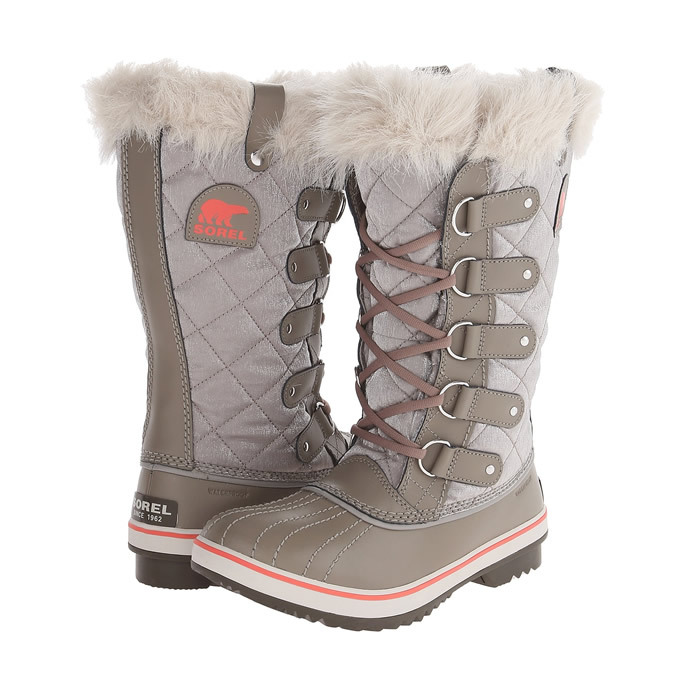 Although the prices are higher, Sorel's website almost always has every size/style/color in stock. Other online retailers where the Tofino Cate boot is often available include Sorel, Shoes.Com and Zappos. Colors Available : Changes yearly, but recent colors are : Black, Kettle Orange, Grizzly Bear Sierra, Curry Red Plum. Weight : 1 lb 8 oz. -25 degree temperature rating works well in most areas during the winter. Just remember to use the right winter sock. Height of the boot and the furry snow cuff work well as a snow gaiter (keeps snow from sneaking inside the boot), but remember to stay out of the mud.